Brunswick Heads accommodation, weekend markets, tours and attractions. Tourist information about accomodation Brunswick Heads, NSW, 2483. A quiet and peaceful town at the mouth of the Brunswick River, in the Brunswick Valley, about 1800 people live here, with another 2000 or so people who live at Ocean Shores, New Brighton and Billinudgel, calling the area home. During the holiday season nearly 3,000 more are accommodated. Visitors are attracted by the fishing village flavour of the place, the riverside caravan parks and the truly superb beaches. Timber bridges provide access from the village to a quiet, peaceful beach that stretches from the mouth of Brunswick River all the way to Byron Bay. Accommodation is primarily caravan parks and motels, with newer apartments units now augmenting modest holiday flats, and a thriving B&B presence in the hinterland, while holiday houses are available at New Brighton and Ocean Shores, just to the north of town. A rocky headland protects the river entrance such that the bar is navigable much of the time, with a sheltered beach for kiddies located inside the breakwater. The extensive estuary upstream of the Pacific Highway bridge supports oyster farms and recreational fishing, while tourism is expanding into arts, crafts, nature based and ecotourism operations, with the marina and the fishing co-operative set for redevelopment after mid 2016. Arts and crafts outlets are now also becoming popular, with a variety of shopfronts along the main street, to compliement the increasing cafe presence. 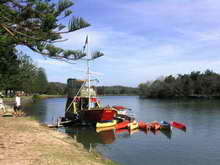 Brunswick Bucaneers Boat Hire can provide fishing gear and licensed boats, canoes, surf skis, and surf bikes to explore the estuary and river. Byron Bay Eco Cruises, based at the marina, offers morning and afternoon guided river cruises, or if you're more adventurous, a kayak discovery tour of the Brunswick River. Land lubbers can relax with a quiet picnic, a bushwalk or a spot of fishing at the Brunswick Heads Nature Reserve just north of town, which has a small picnic area with tables and public toilets, accessible via a road winding through littoral rainforest, along the northern river bank. Access to the Nature Reserves and World Heritage listed National Parks is through Mullumbimby about 10 km away. A little further north, the township of Ocean Shores boasts a scenic 18 hole golf course and all the shopping outlets and services you'll need for a complete holiday break at Ocean Village Shopping Centre, while New Brighton is a delightful residential area. And a visit to the award winning Humble Pie Co., on the corner of the Pacific Highway at Billinudgel, is a must on any visit to the area! Brunswick Heads Riverside Weekend Markets are held on the 1st Saturday each month, with the New Brighton Farmers Market held every Tuesday from 8am - 11am. The Fish & Chips Festival in January, with a fishing competition, wood chopping, fireworks and more, started in 1961 and is still going strong. 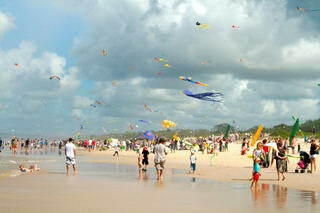 The popular Kites & Bikes Festival is held in late March every second year, or as volunteers and community resources allow. The last K&B Festival was held in 2013. Information on dog exercise areas, walks and dog friendly businesses can be found here. Getting here is easy. Brunswick Heads is approximately 795 kilometres - about 10 hours drive north from Sydney and about 90 minutes drive south from Brisbane via the Pacific Highway. Intrastate flights are also available to Lismore Airport, with all airports having car hire facilities or local rental services available nearby. Daily interstate coach services are available from Brunswick Heads to Brisbane and Sydney, and daily or overnight train service is available to Sydney and Brisbane via coach transfer at Casino. Visit Brunswick Heads - Transport Services Information for more transport information, including trains, coach and local bus schedules, taxis, airport, and transfer services for Byron Bay and surrounding localities, including the Byron Arts & Industry Estate, Mullumbimby, Brunswick Heads, Ocean Shores, New Brighton, South Golden Beach and Billinudgel.